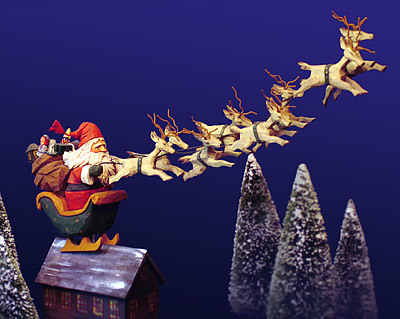 It's magical... Santa and eight tiny reindeer flying over your house! Vaughn & Stephanie Rawson were founding members of american-artists.com. They brought much joy to those who followed this site, admired, and purchased their work -- and to everyone who appreciates fine detail, craftsmanship, and whimsy. I include myself in that mix, and invite you to see more magic from Vaughn Rawson, The Whimsical Whittler.